For leading chain hotels, head to the area around Orchard Road, considered the tourist center of Singapore due to its varied selection of rooms, good travel links, and tourist-focused businesses. At the eastern end of the road, you'll find more luxurious and expensive options, with hotels located in impressive colonial-era architecture. North and south of this main artery, backpacker hostels and budget hotels provide affordable rooms with basic facilities. A Singapore vacation reveals the many charms of a leading city-state and regional hub of culture, retail, and tourism. Browse the many malls and explore a diverse selection of restaurants, cafes, bars, and markets throughout the city, providing a window into the multicultural makeup of Singaporean society. Enjoy nature sightseeing trips, visits to cultural institutions, and tours of the city's varied colonial-era and modern architectural landmarks. Visit the islands just off the coastline to find luxurious resorts and theme parks, ideal spots for family-friendly holidays in Singapore. Gardens by the Bay: This popular park, a blend of diverse plant life and modern technology, attracts crowds of visitors with its lush, stunning scenery and futuristic designs. Singapore Zoo: Since its opening in 1973, Singapore Zoo has been enchanting guests with innovative, naturalistic habitats and the endangered animals it houses. Universal Studios - Singapore: Rides and attractions for all ages await at this amusement park, divided into sections inspired by popular Hollywood movies. Chinatown: This historical Chinese neighborhood is packed with street food stalls, vibrant markets, temples, and traditional shops, making it one of the most popular places to visit in Singapore. Singapore Flyer: From the apex of this Ferris wheel--one of the world's tallest--you can enjoy sweeping vistas of the city-state. Singapore Botanic Gardens: Established in 1859, these World Heritage-listed gardens encompass a lush rainforest, scenic lakeside spots, and a staggeringly diverse orchid collection. Marina Bay Sands Skypark: A roof terrace connects the towers of the Marina Bay Sands complex, boasting panoramic views of the city and a pool with a vanishing edge. Night Safari: Exploring this nocturnal wildlife park, you can encounter everything from rhinos and elephants to tarsiers in spacious, natural-looking enclosures. Orchard Road: Shopping malls, boutiques, cafes, and restaurants line the sides of Orchard Road, the city's commercial hub and a premier tourist attraction in Singapore. You won't have trouble planning a Singapore itinerary for a family trip, as the city-state has a goldmine of kid-friendly attractions and activities. Ignite kids' imaginations at engaging museums, such as Mint Museum of Toys, Science Centre, and KidsSTOP™, and let them run and explore in the playgrounds and educational centers at Gardens on the Bay and National Orchid Garden. 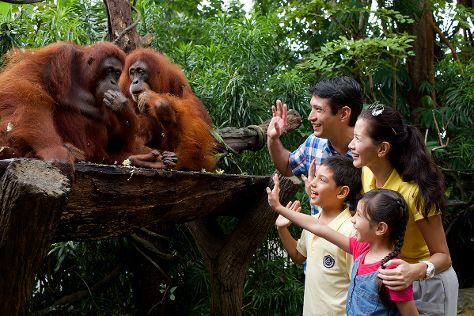 Animal lovers of all ages will enjoy visits to Singapore Zoo or River Safari Singapore. Amusement and theme parks abound, especially on Sentosa Island, which houses everything from Universal Studios to Adventure Cove Waterpark and S.E.A. Aquarium. Filled with lush green parks and renowned for its safety, Singapore proves a family-friendly vacation destination. The streets are famously clean and spacious, hotels plentiful, and public transport efficient, so you're unlikely to run into any problems during your trip. Plenty of well-stocked supermarkets and a wide variety of dining options make it easy to self-cater or eat out with young ones. The only downside to a family trip to Singapore is that it's not exactly budget-friendly, especially compared to neighboring Asian countries. As a blend of cultures and home to a large population of expats and immigrants, Singapore boasts a varied culinary scene, drawing influences from neighboring countries, as well as Western, Indian, and numerous other cuisines. Borrowing largely from Chinese and Malay traditions, Singaporean dishes often include rice, noodles, seafood, and plenty of aromatic spices and sauces. Tropical fruits (such as the distinct-smelling durian), fish head curry, and "ice kacang" (grated ice with jelly, syrups, and seeds), are some of the specialties. Locals have a well-known love of food, and you'll find plenty of dining choices on your Singapore holiday--from affordable vendors and hole-in-the-wall spots, to large al fresco restaurants and fine dining establishments. Although pricier than other Southeast Asian countries, the sheer abundance of options makes Singapore a premier shopping destination. On a trip to Singapore, you'll encounter everything from street markets to gargantuan shopping malls. The commercial hub of Orchard Road is home to massive shopping centers, while the historic Chinatown is the place to go for colorful marketplaces and traditional shops. Wandering the narrow Haji Lane you'll find a multitude of vintage stores and souvenir shops, while Little India boasts bargains on clothing and electronics. For some high-end retail therapy, head to the swanky boutiques at The Shoppes at Marina Bay Sands. You’ll find plenty of options for gifts and keepsakes in Singapore, whether you’re looking for traditional handicrafts and jewelry, aromatic spices, or a quirky souvenir, such as a bottled version of the Singapore Sling--the famous local cocktail. * Although it's not prohibited to chew gum in Singapore, selling or buying it is illegal. * Singapore consists of 63 islands, however, most of them are uninhabited. * Singapore is one of only three city-states in the world. * Singapore is a member of the Commonwealth. Singapore is renowned for the cleanliness of its public spaces, partly due to its strict laws and steep penalties for disobeying them. Littering, vandalism, smoking outside of designated areas, and especially spitting out chewing gum, all carry heavy fines or even jail time. An even stricter drug policy gives long prison sentences for drug-related crimes--and in some cases the death penalty. Needless to say, you shouldn't engage in any of these things during your trip to Singapore. Gift-giving and receiving also involves some complexities. Refrain from opening a gift in front of the giver or wrapping presents in white paper; and do not give alcohol to a Muslim, leather goods to Indians, and flowers to locals of Chinese descent. As a melting pot of cultures, Singapore observes numerous annual holidays and festivals, especially Chinese, Malay, and Indian. Celebrated in January or February--depending on the lunar calendar--the Chinese New Year brings parades and bright red decorations to the city, especially in the Chinatown district. Singapore's many Muslim residents observe the holy month of Ramadan (June or July), while Little India comes to life with vibrant colors during Deepavali, or "Festival of Lights" (October or November). Attending these and other celebrations can be a great way to experience local cultures first hand on your Singapore holiday. Singapore is a vibrant blend of many cultures and ethnicities, so proper greeting etiquette may vary depending on the descent of the person you're communicating with. Nevertheless, handshakes are widely used as a means of greeting, though a Muslim or Hindu woman may not shake hands with a man. If you're not sure how to greet someone on a trip to Singapore, wait for the other person to offer their hand or opt for a small bow. English remains the lingua franca, so you can use English when meeting someone for the first time. Other official languages are Malay, Tamil, and Mandarin Chinese. Singapore enjoys a tropical climate with very little variation. Quite humid and with plenty of rainfall, the city-state experiences average daily temperatures from 23-31 C (73-88 F). As the weather rarely fluctuates, you can plan a Singapore vacation any time during the year, although December and January tend to be slightly cooler, and May through September slightly drier. The easiest way to get around on your Singapore trip is the MRT, or Mass Rapid Transit, an efficient railway system that links most of the city's attractions. Traveling by bus, although slower, is also comfortable and affordable. Taxis cost more than other means of public transport, but provide a good way to access places not connected to the MRT or bus routes. Tipping is not customary and won't be expected of you on a tour of Singapore. Although many restaurants and hotels add a ten-percent service charge to your bill, this doesn't usually go to the staff. Instead, if you wish to thank a server or porter for their service, it's best to give them cash directly. Taxi drivers and tour guides also won't expect a tip, while airport employees are actually not allowed to accept money.